Speakers at the alternative summit said politicians lack room to manoeuvre given that real power sits with big business. At a minimum, state leaders should not obstruct solutions to worldwide economic problems developed elsewhere, they said. Trade agreements like the Transatlantic Trade and Investment Partnership (TTIP), Trans-Pacific Partnership (TPP) and the planned EU-India free trade agreement could end up cementing structures catering more to large companies than to individual citizens. TTIP is expected by the critics to be an important topic in Elmau. 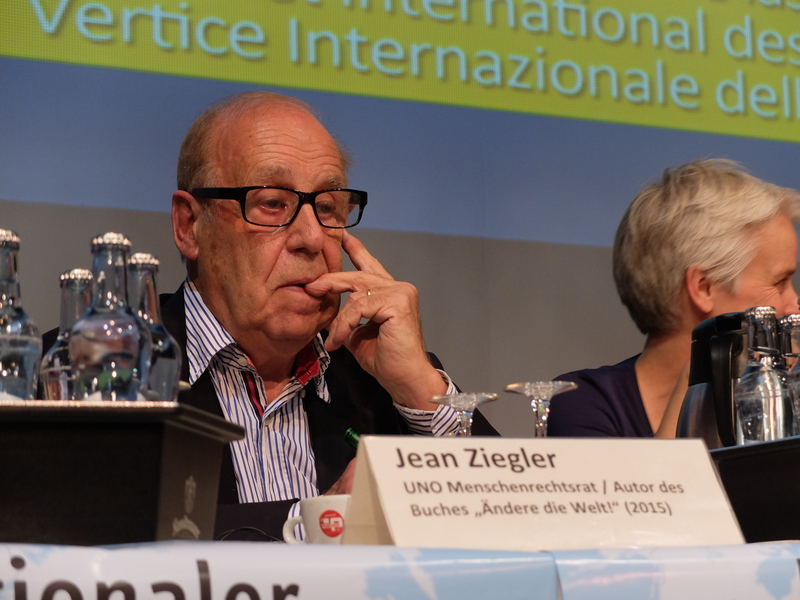 “If somebody in this room believes that the G7 summit is a meeting of independent state leaders, that is a fallacy,” Ziegler told the 650 participants of day one of the Alternative Summit. Just 500 big companies, Ziegler said, referring to statistics of the World Bank, control 52.9 percent of the world’s GDP. “They have power like no kings, emperors or popes had ever before,” said Ziegler, a professor of sociology and a Swiss politician. This small group is shaping the markets and controlling technologies. “In Basel every month a new molecule is developed. A new financial instrument is developed every two weeks,” he described. An example of how G7 meetings remain without consequences for the former UN rapporteur for the right to food is the reluctance to ban speculative trading in basic food like rice, corn or grain. At the G7 in Heiligendamm in 2007, the fight against hunger in Africa had been the topic. Hundreds of millions of dollars were promised, of which some have never been paid. Simply adding legislation to ban speculation of basic foodstuff at stock exchanges could have saved many. “When the prices for corn or rice rise over 30 percent or double, children in the slums and favelas of the world die,” Ziegler said. Counter-Productive to Feeding Poor Nations? Jayati Ghosh, professor of Economy at Jawaharlal Nehru University in New Delhi, and executive secretary of the International Development Economics Associates (IDEAS), in her keynote speech strongly warned against the much-debated TPP and TTIP, as well as the EU-India FTA still under negotiation behind closed doors. Pointing to the experience of US complaints about the Indian food security bill, Gosh said countries like India are sold on the benefits of access to textile markets, and at the same time give up control in areas such as intellectual property regimes or science. The day that India passed its food security bill, the US went to complain at the WTO, Gosh said. Yet WTO meanwhile is seen as “the good guys” somehow, because all the regional free trade agreements now are “WTO plus”. “There is much more data exclusivity, there are much more stringent demands on governments, and there is more investor protection and investor-state dispute settlement,” she said. States are bound more, but not the market. Gosh had some alternative proposals to present. One was to get away from evaluating the success of economies on the basis of GDP figures, as “GDP is not enough.” To evaluate economies, she proposed to “focus on standards of living of the bottom half,” Gosh recommended. Gosh’s second plea was for a “much bigger role of governments.” Given the many critical comments about the G7 state leaders there is a need for qualifying that, though. 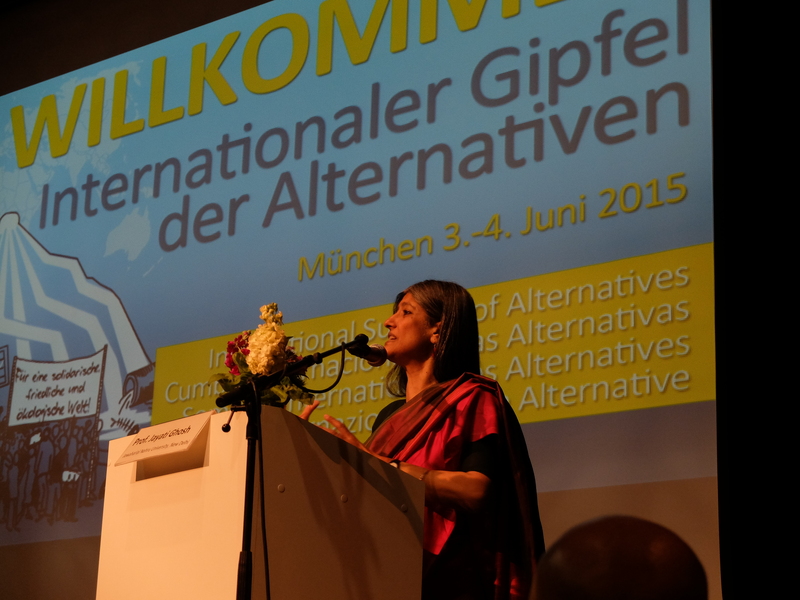 Gosh told Alternative Summit participants that democracies have to change in style. “Democracy is more than periodic elections,” she said. Gosh had more proposals to tame the market. “Why can’t we demand a global tax and why not tax multi-national companies as one and then share it?” she suggested, referring to ideas of Nobel Prize winning economist Joseph Stiglitz. Otherwise, multinationals will use “regulatory arbitrage,” she said. Jörn Kalinski of Oxfam said at the closing rally of the protest march that his organisation is calling on the G7 to at least regulate for complete transparency about how much tax is paid by multi-nationals in every market in which they are active. 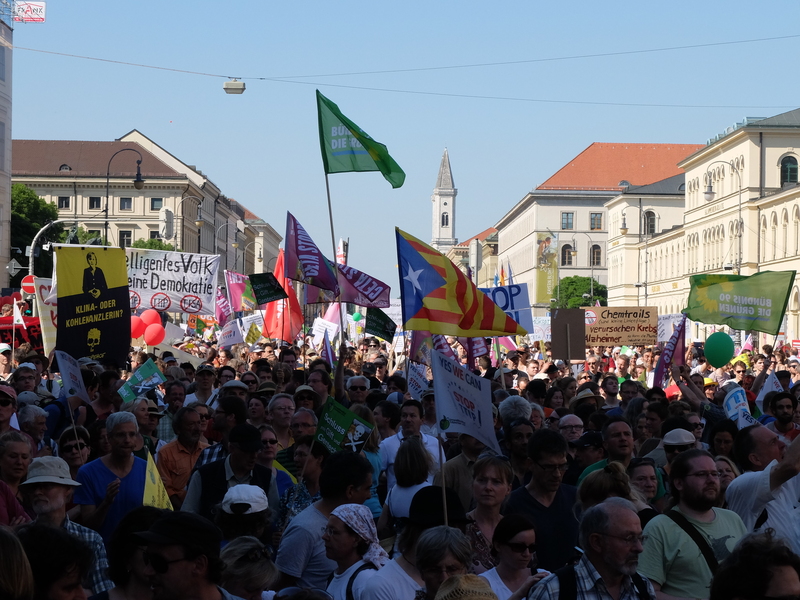 Some 40,000 people who might call themselves members of that civil society of the planet came to a protest march on 4 June in Munich that concluded the two-day Alternative Summit. 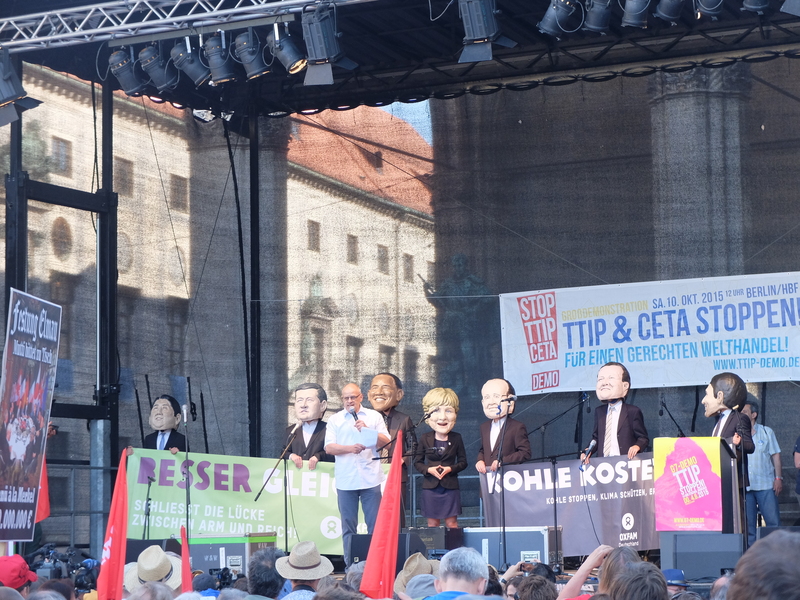 The number is double the Anti-TTIP/TISA/CETA march in Munich just six weeks earlier. More protesters are expected tomorrow at a rally in Garmisch Patenkirchen. And on 7 June, the Stop-G7 initiative, which organises the rallies, is calling on citizens to join a 11-kilometer demonstration march from different starting points around Garmisch to end at Elmau Castle – or more specifically, at the fence that has been set up in the woods around the castle. An estimated 17,000 police officers are on duty securing the area and the surrounding cities. The Stop G7 initiative on 2 June won an important legal battle over its plans to set up camp in Garmisch for the activists. In a decision Tuesday, the Munich Administrative Court ruled that decisions by local authorities could not be upheld. Local authorities had tried to prevent the camp to the end by citing, for example, flood control on the pasture of the one local farmer, who had agreed to allow the camp on his pasture. The official website of the G7 meeting is here. 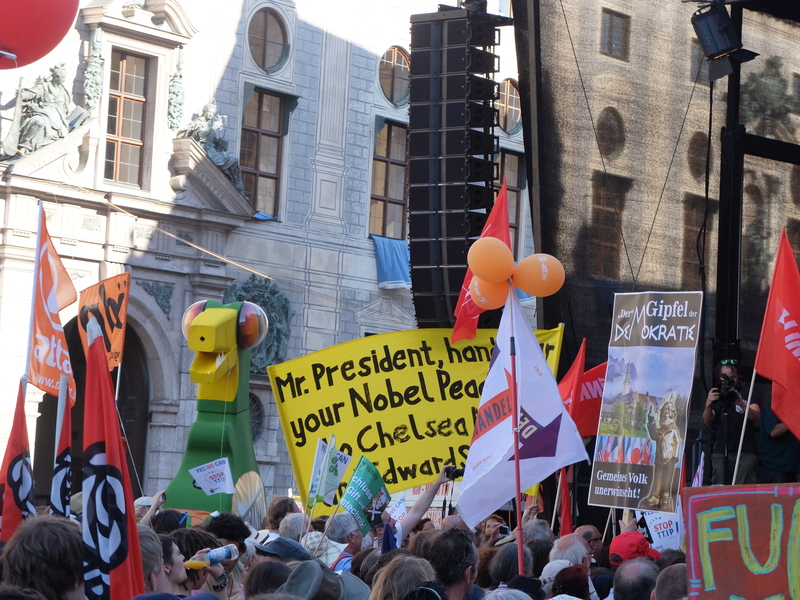 "Alternative Summit Offers Ideas For Trade Agreements, G7, Amid 40,000 Protesters" by Intellectual Property Watch is licensed under a Creative Commons Attribution-NonCommercial-ShareAlike 4.0 International License. It really wouldn’t matter what policies either G7 or alternative G7 proposed, there would still be a crowd of thousands to protest against “bad politics” absolutely Whatever they were.